JEFFERSON CITY, Mo. 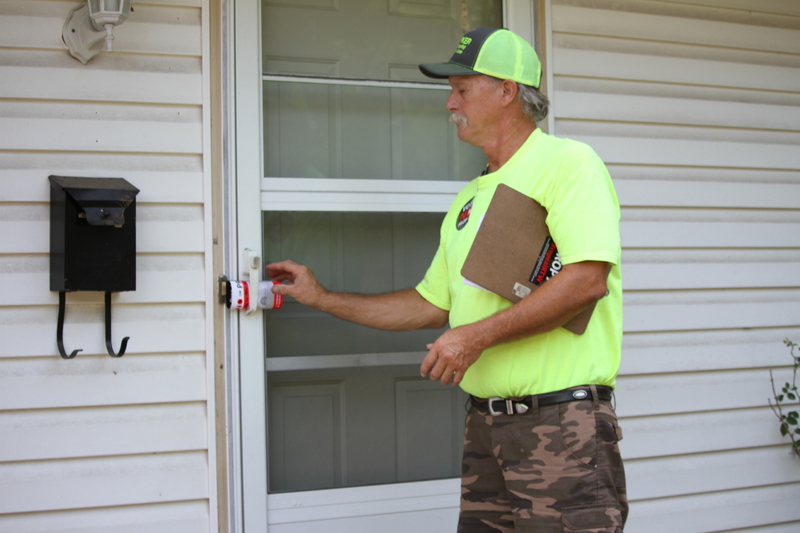 — Tim Thurman walked up to the first address on his list a little after 5:30 p.m. on Wednesday. He knocked on the door, waited roughly 30 seconds, slipped a piece of literature in the door handle — not in the mailbox, he’s been advised that would be a federal offense — and moved on to the next house on the list. Thurman and his canvassing partner repeated this seven times before someone answered the door. “Are you familiar with Proposition A?” he asked after introducing himself as a volunteer with We Are Missouri. “No,” the potential voter answered. And with that, Thurman dove right into his spiel on the ballot measure. He made sure to hit all his talking points: it’s bad for Missourians, it will hurt working families, and it will lower wages — he cites federal data that has folks in states with similar laws making more than $8,000 less than folks in states without the law. After Thurman finishes describing what he believes are the consequences of the law, he gives the potential voter a pamphlet of information, recommends a few news articles to read, shakes his hand, and moves on the next address on the list. The whole interaction lasts less than three minutes. Thurman is a canvassing veteran on the issue having volunteered when We Are Missouri first started knocking on doors in Jefferson City roughly three week ago. The effort they are making is to defeat Prop A, the so-called right-to-work referendum. In 2017, the Missouri General Assembly passed Senate Bill 19, which was promptly signed by then-Gov. Eric Greitens. Labor unions and their supporters subsequently gathered the needed signatures to put the issue to a statewide vote in 2018. The last referendum happened in April 1982, regarding a law permitting large trucks on state highways — it was defeated. Only two referendums in Missouri history have been approved, with 24 out of 26 failing. In less than a week, Missourians will take to the polls to decide whether or not to become a RTW state. The measure is on the August 7 ballot along with the primary election. RTW laws prohibit unions from charging “fair share fees” to non-union members for work the union does on behalf of the non-member. Under current federal law, no one is required to join a union and no one can be forced to pay union dues as a condition of employment. However, unions are required to represent every employee covered by a union contract, even non-members. Non-members in a collective bargaining unit get all the benefits of collective bargaining agreements and if a non-dues-paying employee has a problem at work, the union is required to represent them — including providing legal representation, if needed, at no cost to the non-member during the grievance process — in exactly the same way it would represent a dues-paying member. To compensate for the work a union does for a non-union member, some unions and employers reach an agreement that the operational costs of bargaining and representation will be shared equally among the workforce. Non-union workers are assessed a “fair-share fee” that is prorated based on their share of the cost of representing them, and is not the same as the full union dues that their coworkers may choose to pay. RTW laws prohibit “fair-share fees.” A reportby the Economic Policy Institute found that “unions in RTW states are the only organizations in the country that are forced to provide all benefits for free to people who opt not to pay for them,” which leads to a decline in union participation and thus unions. The decline in unions is what leads to lower wages across the board, according to Economic Policy Institute, which typically leans in favor of unions. “We are Missouri believes that Proposition A would lower wages and harm working-class Missourians. The fact that workers in RTW states make less than workers in non-RTW state is not surprising – that is the whole reason for the enormous corporate interest in right to work. It is in the interest of corporate CEOs to increase their bottom line and corporate profits by lowering wages,” said Erin Schrimpf, a spokesperson with We Are Missouri. Opponents of the law point to data from the U.S. Department of Labor and the U.S. Census Bureau that families in right-to-work state $8,740 less than those in non-right-to-work states. But the data and studies on right-to-work are mixed, depending on what states are looked at. Supporters of right-to-work point to Wisconsin, Indiana, and Michigan as states whose economy improved after adopting the law. The year following Wisconsin’s adaptation of the law, their per capita income grow at twice the rate of the national average. Similar trends — if not as high — can be found in Indiana and Michigan. According to the Bureau of Economic Analysis, wages grew at 7.7 percent between 2005 and 2015 with right-to-work and non-right-to-work states growing at the same rate. When the Economic Policy Institute compared Missouri to neighboring right-to-work states — Arkansas, Iowa, Kansas, Kentucky, Nebraska, Oklahoma, and Tennessee — the Show-Me State workers come out ahead in earnings. Their report found that after accounting for a state’s cost of living and workers’ education and background, workers in right-to-workstates earn 3.1 percent less than their non-right-to-workpeers. At the time of the EPI’s study, Missouri and its right-to-work neighbors has the same unemployment rate. In 2017, both the highest labor force participation rate in the country — in North Dakota — and the lowest — in West Virginia — were in states with right-to-work laws. There are currently more than 20 right-to-work states in the nation, 19 of which adopted the law before 1963. Five states have adopted right-to-work legislation since 2012. Next Next post: Editorial: Right to Work – Good or Bad, and for Whom?